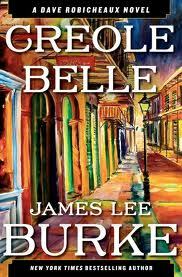 This is Burke’s 19th novel about detective Dave Robicheaux, New Orleans area detective in a very gritty underworld. As beautifully as Burke writes, and as lush as the setting, that’s how really horrific the criminal element gets. This is the stuff of devils and angels – Burke writes like an angel (think Faulkner) about the stuff of demons. The novels, as they’ve unfolded have gotten more and more gritty and maybe Burke’s word-smithing has lost something for it – it’s not as fresh anyway, and a bit more expansively preachy (although I’m certainly in agreement). In Creole Belle sober alcoholic Robicheaux and his side-kick, the still hard drinking Cletus Purcel, unwind a tangled tale of oil-rig shenanigans, missing jazz singers, drug addiction, forced prostitution. And the ghosts of the old slaves, family, Vietnam, even El Salvador hover over all. It’s the stuff of straight Burke/Robicheaux. I’m not going to reveal the plot because in terms of the relationships which permeate any serial detective story this would likely entail some serious spoilers but I will say that Clete finds a daughter he never knew he had – and this may not be good news.